I am a 10 year old boy in Gilbert Arizona. I am a straight A student, brother to 3, and an amazing son. Some of my favorite things to do for fun are watch movies, play board games, and hangout with firends and family. I am also an avid football and basketball player and have been playing since I can remember. On March 27, 2012 I was involved in a horrible car accident that has left me paralyzed from the neck down. It is considered a C1-C2 injury. I spent 6 weeks at Maricopa Medical Center before being transported to Kennedy Kreiger Institute for 4 months for rehabilitation. I am working as hard as I can everyday, with the utmost confidence that I will get better. Family and friends of Drew Ackert are raising money to pay for uninsured medical expenses associated with catastrophic injury. Drew’s family has chosen to fundraise with HelpHOPELive in part because HelpHOPELive assures fiscal accountability of funds raised and tax deductibility for donors. Donors can be sure that funds donated will be used only to pay or reimburse medically-related expenses. For more information, please contact HelpHOPELive at 800.642.8399 . Sept 30 we’ll be part of a fundraiser for our drummers cousin. 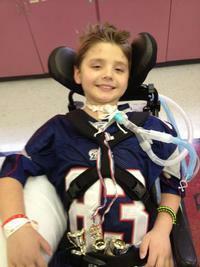 He was in a car accident which has left him paralyzed from the neck down. He just turned 10. If anyone has Raffle donations we’ll be looking for them down the road. Dear Drew, I know this is a stretch, but I am first cousin to your older brother's dad. When your brother's grandmother, my aunt Patty, shared your story with us, I asked my 8th grade class to say a Rosary on your behalf. We will keep praying for you, and your job is to keep making amazing improvements!